With 4th of July out of the way and summer still charging on, grilling season is far from over. No summer classes to go to or finals to tackle means more time to spend with friends and family outdoors. With a small grill or saucepan, many summertime dishes can be created to fit any type of eater, from the fish lover to the meat eater and all the way down to the hard-to-accommodate vegetarian. Check out the recipes below, and get grilling! 1. Rinse the fish, and then pat it dry with paper towels. Lightly sprinkle salmon with salt and pepper. 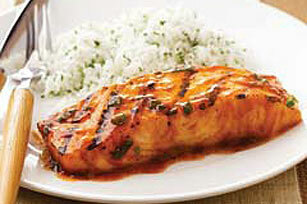 Place two tablespoons of the barbecue sauce in small bowl and brush sauce on both sides of the salmon. 2. For charcoal grill, cook salmon on a greased grill rack directly over medium coals for 8 to 12 minutes or until salmon flakes when tested with a fork, turning once halfway through grilling. 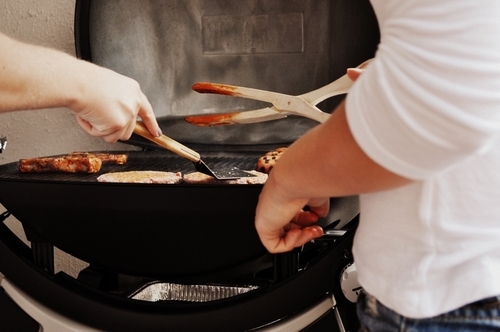 For a gas grill, preheat it, and then reduce the heat level to medium. Place salmon on the greased grill rack over medium heat and cover and grill as above. 3. For the nectarine salsa, combine nectarines, blueberries, pecans, and the remaining one tablespoon barbecue sauce in a medium-sized bowl. Season it with salt, and serve the salmon with salsa and lemon wedges. The dish serves four people. 1. For the sauce, combine all of the ingredients except the chicken in a small-sized saucepan. Bring to boiling over medium heat, stirring frequently; reduce heat. Let it simmer, and then cover it for three minutes. Set aside. 2. Rinse the chicken, and then pat it dry. 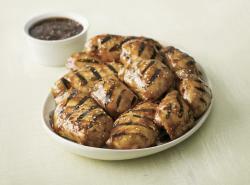 Grill the chicken on the lightly greased rack of an uncovered grill directly over medium heat for 12 to 15 minutes or until tender and no longer pink, turning once and brushing with sauce once or twice during the last five minutes of grilling. 3. In a small-sized saucepan, heat the remaining sauce until it is bubbly, and then pass it with chicken. This dish serves six people. 1. Prepare the barbecue for medium heat. Pull off the husks from the corn cobs, and remove the corn silk. 2. Drizzle the oil over the corn to coat lightly. 3. Place the corn on the grill. Cover and cook, turning occasionally, until the corn is soft and juicy and lightly charred, for about 15 minutes. Transfer the corn to a platter. 4. Meanwhile, grill the bacon until it is golden brown and crisp, about three minutes per side. Transfer the bacon to a plate lined with paper towels to drain excess oil. Finely chop the bacon. 5. Stir the softened butter, sun-dried tomatoes, shallot, parsley, garlic, oregano, thyme, lemon juice, crushed red pepper and bacon in a medium bowl to blend. Season to taste with salt and black pepper. 6. 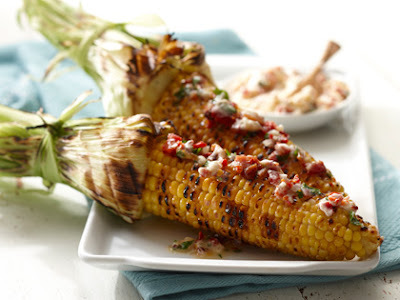 Spread the softened butter mixture all over the hot grilled corn. Serve and enjoy. 1. Fire up the mini grill! 2. In a 5-to-6 quart saucepot or Dutch oven, place collapsible steamer basket and 1-inch water. Cover saucepot; heat water to boiling on high on range top. 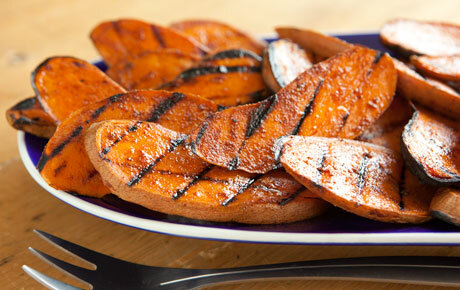 Cut sweet potatoes into 1/2-inch-thick diagonal slices. 3. Place potato slices in steamer basket; reduce heat to low. Cover saucepot and simmer 12 to 15 minutes or until potatoes are just fork-tender; do not overcook. (Potatoes can be steamed a day ahead and refrigerated until ready to grill). 4. Transfer potato slices to jelly-roll pan; brush with olive oil and sprinkle with salt and pepper to season both sides. Place the potato slices onto a hot grill grate. Cover the grill and cook the potatoes for about 10 to 12 minutes or until lightly charred and tender, turning slices over once with large metal spatula. Transfer potatoes to serving bowl, and garnish it with parsley. 1. Heat the grill or a grill pan to medium-high heat. 2. Trim the stems from the mushrooms. Slice the eggplant, squash and zucchini into 1/4-inch-thick rounds. Brush vegetables with canola oil, sprinkle with salt, and grill until softened and grill marks have formed — about 10 minutes each side. (Brush with oil as needed to prevent sticking). 3. Transfer to a baking pan. Heat broiler to low. Split the buns; brush the tops with the sesame oil, and sprinkle with sesame seeds. 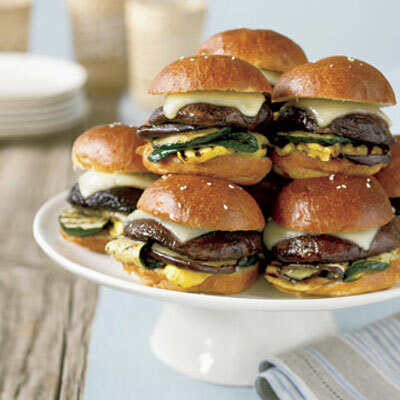 Layer the squash, zucchini, eggplant and mushroom on the bottom bun halves. Top each with cheese, and broil until cheese melts, about one minute. Top with remaining seeded bun tops and serve hot. 1. Melt the butter in a small saucepan. 2. Add the flour and stir vigorously until the mixture is bubbling. Remove the pan from the heat, then slowly whisk in the half and half until it is fully incorporated and there are no lumps. 3. Return the pan to a medium-low heated stove, and use a silicone spatula to continuously scrape the bottom of the pan to keep the sauce from burning. When the sauce is thick and bubbly, remove the pan from the heat and add the mac & cheese. 4. Stir to combine, then taste for salt, and adjust as needed. Cool to room temperature, and then place the mixture into the fridge to harden. 5. Once the macaroni mixture has cooled, it will be very firm. Use a spoon to scoop out a 1 1/2″ ball, then roll it between your hands to make it round, pressing down a bit to remove any air pockets. You should be able to make about eight balls. 6. Add about two inches of oil into a heavy-bottomed pot. Turn the heat onto medium high, and watch for the temperature to reach about 320 degrees F.
7. In the meantime, get three shallow bowls out, and put the flour in one, the egg in another and the panko in the third. Roll each ball in the flour to coat evenly and then in the egg (make sure it’s well coated with egg or the panko won’t stick). Lastly, drop the balls in the panko and roll around to coat evenly. 8. Line a wire rack with paper towels to place the balls on once they’re fried. Fry each ball, rolling them around so they brown evenly until they are golden brown and crisp. 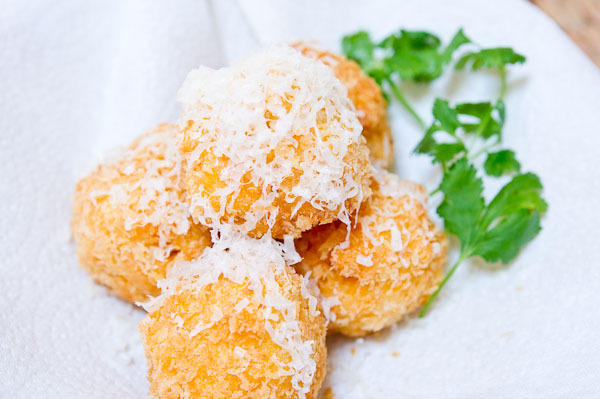 Transfer the fried mac and cheese balls to a paper towel lined rack, and let them drain. Let them cool for a minute before serving, and then top with plenty of grated cheese.